The New Holland pattern is inspired by traditional Pennsylvania Dutch folk art designs. New Holland is one of the few promotional patterns released as a set. A reversible cork trivet came with the New Holland set. New Holland is one of the few promotional patterns released as a set. The two-piece Oval Casserole set debuted in 1973 with the 1 ½ quart casserole (043) and the 2 ½ quart casserole (045). The set included a reversible cork trivet that could be flipped to the correct side depending on the casserole size in use. 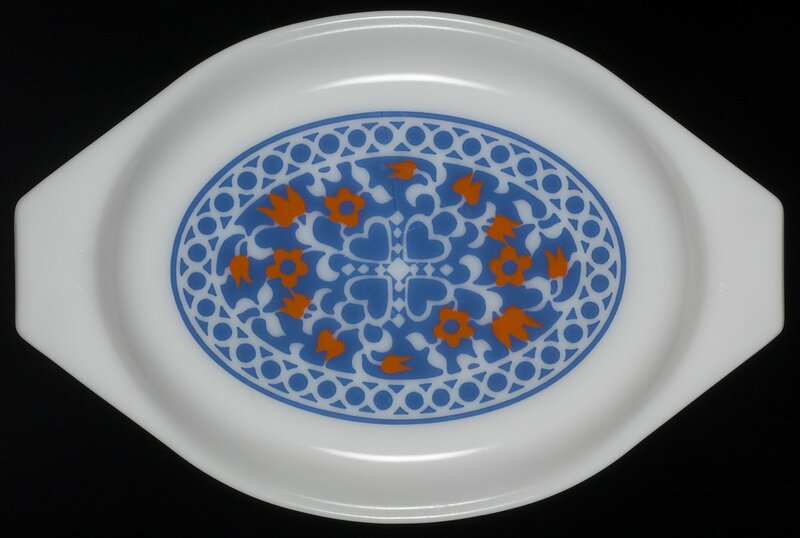 The New Holland casseroles are both solid blue with a white opalware lid designed with blue and red Pennsylvania Dutch-inspired floral folk art.